As you move up the grading scale, you begin to rise in quality and overall appearance. A higher graded coin will always be worth more than the same coin in a lower grade. Coins that fall in the range of 60 to 70 refer to mint condition examples, or Mint State (MS, for short). So there are actually eleven different mint state grades possible. The grade of 65 refers to a gem-quality example. Grades higher than 65, particularly on Pre-1933 gold or silver, represent extremely high end and rare examples. Coins in the 50’s refer to Almost Uncirculated (AU for short) examples. There are only FOUR different AU grades: AU-50, AU-53, AU-55 and AU-58. About Uncirculated grades often show little evidence of wear and are typically confused for mint condition coins by the untrained eye. Coins in the 40’s refer to Extremely Fine examples, (XF for short). There are only TWO different extremely fine numerical grades: XF-40 and XF-45. Typically coins in the Extremely Fine grade levels will show wear on the high points, but all design details are still quite evident. Grades ranging from 10 up to 35 are referred to as Very Fine examples. Some noteworthy benchmarks in the VF grades are Fine 12, Very Fine 20 and Choice Very Fine 30 and 35. The lowest grade ranges are About Good 3, Good 4 and Very Good 8. These coins will often be incredibly worn with flat design details. There can be different levels of eye appeal within a certain grade based on toning, luster and boldness of strike. Coins with extraordinary eye appeal will often trade at a premium to inferior examples. 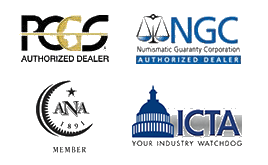 These organizations act as unbiased, third-party graders that both dealers and investors/collectors can trust. Once a coin is sent to the grading service and a grading fee is paid, these services will make sure the coin is authentic, determine an appropriate grade for the coin, seal the coin in a tamper-proof holder, insert a label into the holder with a description, grade, serial #’s and a barcode, and keep a record of the graded coin in their population reports. By using third-party grading consumers and dealers alike can purchase coins sight-unseen, knowing that they have been certified and graded by either PCGS or NGC.